Gotta hand it to the team at Paddy Power. 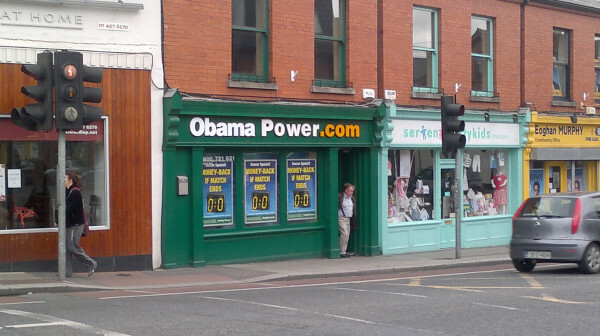 They’ve only gone the direct route in support of Paddy O’Bama and hope that a single view of a betting shop front might get him to change the US’ legal stance on betting. It’s in my local stomping ground, so I’m hoping that I can sneak up pre-visit – and rearragange it to ” aw PrebOom.com” – and see do we get any sympathy. Top marks to their team for thinking outside the box, sorry, shop. « How the hell does Amazon control 30% of all ecommerce in the US?